Quite simply, it's the utility for Windows you thought you didn't need, but when you use it, you wonder how you managed before! Please read all the content and join up! Paste as file will create a file with anything that's copied onto the clipboard. You can copy images, text and web content and then easily paste it onto Windows Explorer. This will then create a file of that content. Convert text, html or any image straight to a PDF! 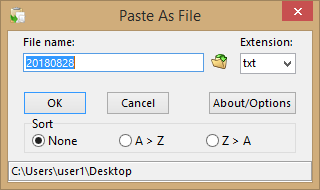 How is "Paste As File" Useful?